I’ve been checking out a new internet marketing tool my friends built that wants to help you acquire more customers online. 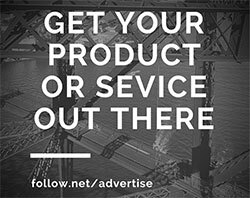 Their service is called Follow, it shows you exactly how your competitors advertise online. Having competitive information about your competitors may give you valuable insights which could help you improve your own online marketing campaigns. Follow also saves you a ton of time, normally to get this data you’d have to visit a dozen of different websites to put it all together. If you spend a lot of time building online marketing campaigns, their software will be a valuable asset to have in your marketing tool set.